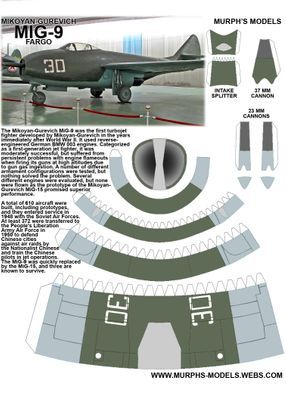 The Mikoyan-Gurevich MiG-9 (Russian: Микоян и Гуревич МиГ-9, USAF/DoD designation: Type 1, NATO reporting name: Fargo) was the first turbojet fighter developed by Mikoyan-Gurevich in the years immediately after World War II. It used reverse-engineered German BMW 003 engines. 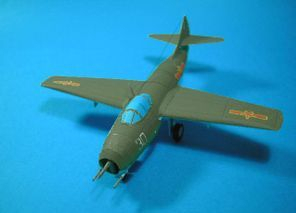 Categorized as a first-generation jet fighter, it was moderately successful, but suffered from persistent problems with engine flameouts when firing its guns at high altitudes due to gun gas ingestion. A number of different armament configurations were tested, but nothing solved the problem. 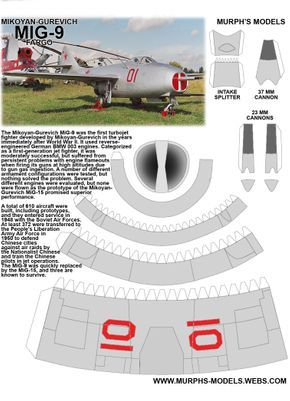 Several different engines were evaluated, but none were flown as the prototype of the Mikoyan-Gurevich MiG-15 promised superior performance. 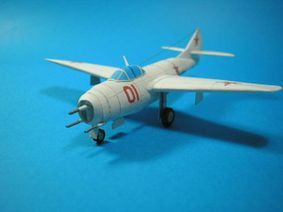 A total of 610 aircraft were built, including prototypes, and they entered service in 1948 with the Soviet Air Forces. At least 372 were transferred to the People's Liberation Army Air Force in 1950 to defend Chinese cities against air raids by the Nationalist Chinese and train the Chinese pilots in jet operations. 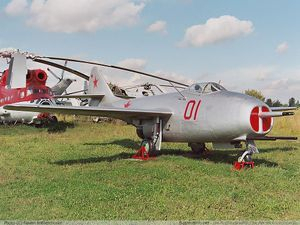 The MiG-9 was quickly replaced by the MiG-15, and three are known to survive.